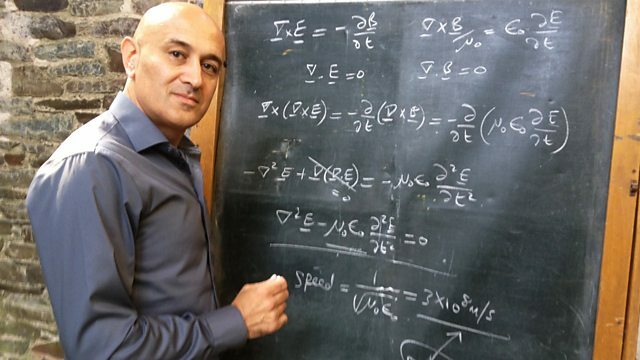 Jim Al-Khalili's life was transformed when he realised the power and beauty of equations to understand the world. He and other scientists discuss their love of equations. For Carlos Frenk, Professor of Computational Cosmology at Durham University, one of the most beautiful equations is the one that is at the heart of Einstein's theory of general relativity. A century ago, Einstein wrote down his now famous field equations that linked the shape of the universe to the matter in it. Jim and Graham Farmelo, the author of a biography of Paul Dirac called The Strangest Man, discuss why the Dirac equation is not as well known as Einstein's but, in their opinion, should be. Dr Patricia Fara of Cambridge University, and Vice-President of the British Society for the History of Science, explains that although mathematics goes back centuries it was only in the 17th century that it was applied to the real world. Jeff Forshaw, Professor of Particle Physics at the University of Manchester, talks about when he first realised the power of equations and about why, surprisngly, maths is so effective at describing the real world. Science writer Philip Ball questions whether the beauty that scientists see in equations is really the same as we see in art. And physics A Level students in Dr White's class at Hammersmith Academy in London reveal that they already appreciate equations.